Mix and match or order 5 of the same species, your choice! All plants are nursery-propagated in south-central Kentucky and most come from local source seed (see About Us). No plants are harvested from the wild. A "one-stop-shop" for bees and butterflies with many flowers in dense terminal spikes. Deer resistant. Grown from Kentucky-source seed. With spikes from 1" to 6" long, this plant makes an excellent source of late-season nectar indeed. Crushed foliage emits a pleasant licorice fragrance. Eye-catching and under-used in the home garden, white-pink globose umbels nod gracefully from arch at the top of the stem. Nectar and pollen primarily attract bees. A gem for the home garden. An umbel of star-shaped flowers form a charming pink sphere. Nectar and pollen primarily attract bees and flower flies. Enjoy 2-season appeal with true blue flowers in spring and lemony yellow foliage in fall. Especially stunning when a number are planted to form a row or along a building. Grown from Kentucky-source seed. Elegant flower for edge of woodland garden. Long lasting seed heads mature into an interesting thimble shape. Grown from Kentucky-source seed. Herbaceous plant of stature and foliage with excellent feathery visual texture. Looks elegant along a woodland border or walk. Flowering plumes in spring resemble Astilbe. Separate male and female plants. Heart shaped leaves spread via rhizomes to form an attractive ground cover for shade. Poke milkweed produces elegant pendulous umbels of white flowers. In nature it is found in areas such as open woods, rich mesic woodlands and along trail edges in moist wooded areas. When looking for a milkweed plant for the home garden, Swamp Milkweed is usually the best fit. It is not stocky nor does it spread vigorously by rhizomes. The milkweeds are one of the best nectar plants to attract pollinators, especially the monarchs which rely on milkweed foliage in the caterpillar stage. Flame orange flowers are stunning in masses or drifts and attract pollinators galore. Interestingly, this plant does not exude the milky sap. Monarch butterfly host plant. Dainty in appearance with "whorls" of thin leaves and elegant clusters of white flowers. This plant is ideal for that tough spot in dry soil and full sun. Spreads by rhizomes. Larval host to the Monarch butterfly. Grown from Kentucky-source seed. Each plant yields a bouquet of lovely pale blue flowers with yellow centers. A source for late-season nectar. Trim to desired height through June. A welcome profusion of lavender blooms late in the season. Good nectar source. Profusion of royal purple flowers, each up to 1.5 inches wide. Flowers may also be shades of pink or even white. Plant may be trimmed to desired height in late spring. Grown from Kentucky-source seed. Perfect height for the home garden, profuse blue-lavender blooms provide the solution to both late-season color and nectar. Trim to desired shape through June. Grown from Kentucky-source seed. Elegant white, pea-shaped flowers displayed along an elongate axis provide cut flowers as early as April. White Wild Indigo is an herbaceous perennial that, in full sun is rounded and bushy but dies back to the ground in winter. Good source of early-season nectar to attract and support our pollinators. Larval host plant for Wild Indigo Duskywing butterfly. Grown from KY source seed. Grown in full sun, forms gorgeous rounded form with blue-green pea-like leaves. Excellent for use in beds & borders and as a cut flower. Larval host plant for the Wild Indigo Duskywing butterfly. 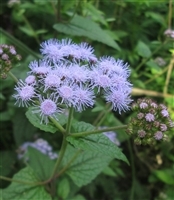 Under-used in home gardens, Downy Wood Mint tolerates a wide range of conditions, is of short stature, provides early season color and fall foliage can present various shades of pink. Also known as Pagoda Plant, this is a wonderful nectar plant for bees. Deer resistant. Grown from Kentucky-source seed. Interesting large, fan-shaped leaves are white or "pale" on lower surface. Clusters of cream colored blooms are highly attractive to pollinators. Grown from Kentucky-source seed. Well sought-after host plant for the Baltimore Checkerspot Butterfly. 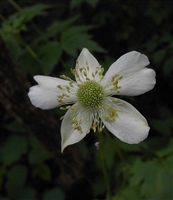 Blooms are white, sometimes tinged with pink. Perfect plant for a damp spot with intermittent light. Grown from Kentucky-source seed. Attractive especially when planted in groups. Best planted in intermediate light with moist well-drained soil such as in a rain garden. 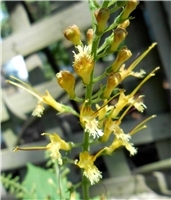 Also know as Goldstar, this is a readily-spreading & low, mat-forming perennial bearing yellow flowers. Excellent ground cover. Daisy-like yellow flowers provide much-needed late-season nectar. 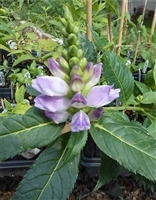 This plant is a good option for use as a matrix species in a flower garden, reducing the need to mulch between plants. Grown from KY-source seed. Intriguing lemony-fragrant light yellow flowers up to 1/2 inch long in loose-terminal arrangements are an excellent source of late-season nectar for pollinators. Leaves emit a citronella-like odor when crushed. Herbal uses are reported. Spreads easily by rhizomes. Grown from Kentucky-source seed. A tried and true plant for the home garden, Lance-leaf Coreopsis is a prolific bloomer and provides excellent cut flowers. Daisy-like 2" wide blooms brighten droughty areas with poor soil & full sun. Three-parted leaves are opposite & sessile and so appear to be whorls of 6 on the stem. A rather airy plant good for tucking between other established plants. Grown from Kentucky-source seed. Tallest Coreopsis topped with delicate flowers that provide food for Goldfinches if allowed to dry and remain into the fall. One larval host plant for the Common Tan Wave Moth and the interesting Wavy-lined Emerald Moth. Plant spreads readily under favorable conditions. Grown from Kentucky-source seed. Purple prairie clover has a deep taproot, making it a good choice for tough, full sun spots prone to drought. Bright, interesting flowers with a long lasting bloom time. Seed is high in protein, a good food source for mammals. A larval host plant for the Dogface Sulfur and Reakirt's Blue butterflies. Grown from Kentucky-source seed. 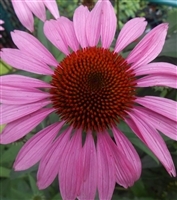 Also known as Glade Coneflower, this plant is elegant with thin reclining petals. It is under-utilized in the home garden and as a cut flower. Attracts bee and butterflies & provides seed for birds if flowering heads remain through winter. Larval host plant for the Silvery Checkerspot butterfly and Wavy-lined Emerald moth. Grown from Kentucky-source seed. A popular plant for good reason. Blooms attract pollinators in summer and their seed feeds birds in the cold months. Beautiful in a home or business planting and in a vase. One larval host plant for the Silvery Checkerspot butterfly and Wavy-lined Emerald moth. Grown from Kentucky-source seed. Rattlesnake Master is surprisingly a member of the Carrot Family. Spherical flower clusters add much interest to a garden or a bouquet. Larval host to an attractive moth, the Rattlesnake Master Borer. Drought-tolerant. Grown from Kentucky-source seed. Billowing clusters of pinkish-purple flowers are lovely en masse, especially in a damp area. Height can be controlled by trimming by up to 1/2 in June. Excellent for attracting butterflies, as a cut flower and dried. Grown from Kentucky-source seed. This excellent late summer nectar source has mauve flowers and is captivating among other moist-soil plants such as ironweed, swamp milkweed, and mistflower. A large plant that is attractive to people & butterflies. Also known as Sneezeweed (a misnomer as it is insect pollinated. Pollen is not dispersed via wind), this plant is under-utilized in the home garden and for cut flowers. The flowers have rounded, nearly spherical yellow centers ringed with notched yellow petals. Trim in late June to desired height. A larval host plant for the Dainty Sulfur butterfly. Grown from Kentucky-source seed.